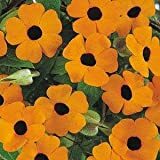 Flower color can be: orange, red, white, pink or yellow with five petals the black inner color. 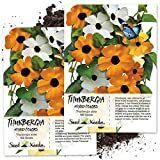 Black-eyed Susan Vine, Thunbergia, 55 Seeds! 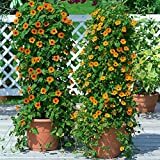 New Thunbergia Alata - Black - Eyed Susan Vine , THUNBERGIA , 55 + SEEDS !